Click on the MONITORING SCRIPTS link at the top of the page. 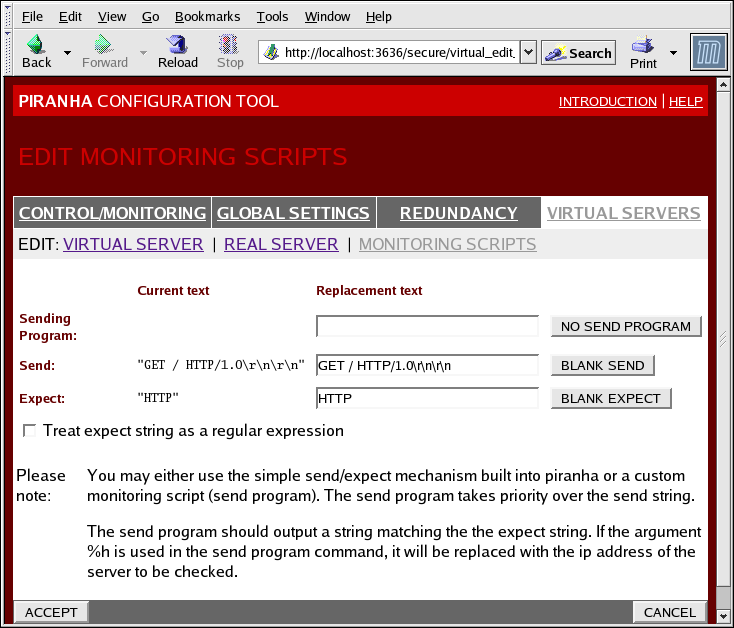 The EDIT MONITORING SCRIPTS subsection allows the administrator to specify a send/expect string sequence to verify that the service for the virtual server is functional on each real server. It is also the place where the administrator can specify customized scripts to check services requiring dynamically changing data. For more advanced service verification, you can use this field to specify the path to a service-checking script. This functionality is especially helpful for services that require dynamically changing data, such as HTTPS or SSL. To use this functionality, you must write a script that returns a textual response, set it to be executable, and type the path to it in the Sending Program field. To ensure that each server in the real server pool is checked, use the special token %h after the path to the script in the Sending Program field. This token is replaced with each real server's IP address as the script is called by the nanny daemon. If an external program is entered in the Sending Program field, then the Send field is ignored. Enter a string for the nanny daemon to send to each real server in this field. By default the send field is completed for HTTP. You can alter this value depending on your needs. If you leave this field blank, the nanny daemon attempts to open the port and assume the service is running if it succeeds. \ to escape the next character which follows it. Enter a the textual response the server should return if it is functioning properly. If you wrote your own sending program, enter the response you told it to send if it was successful. To determine what to send for a given service, you can open a telnet connection to the port on a real server and see what is returned. For instance, FTP reports 220 upon connecting, so could enter quit in the Send field and 220 in the Expect field. Remember to click the ACCEPT button after making any changes in this panel. To make sure you do not lose any changes when selecting a new panel. Once you have configured virtual servers using the Piranha Configuration Tool, you must copy specific configuration files to the backup LVS router. See Section 4.7, “Synchronizing Configuration Files” for details.